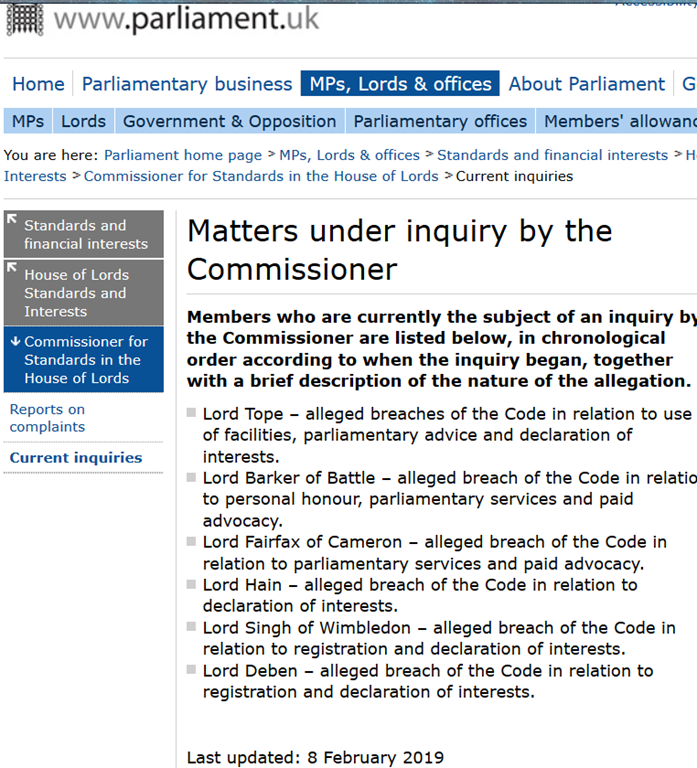 It has been officially announced that John Gummer/AKA Lord Deben is now the subject of an inquiry by the Commissioner for Standards in the House of Lords, for alleged breach of the Code in relation to registration and declaration of interests. This follows the revelation that his family company has benefited to the tune of £600k of income from companies which stand to make profit directly from the advice to the government from the Commission on Climate Change. which Gummer chairs. My understanding is that the inquiry does not relate specifically to this. It would appear though that Gummer has made several speeches in the House of Lords, to similar effect to the advice already given to government, without declaring his financial interests in the matter. This is potentially a far more serious accusation than any potential misconduct at the CCC, as Parliament takes such matters much more seriously. Without wanting to prejudge the issue, it is hard to see how Gummer can hang onto his role at the CCC for much longer. ← Matt McGrath Bangs His Global Warming Drum-But Is Anybody Listening? Potentially. The “Establishment” has a way of looking after its members. Fingers crossed. Healthy, though for it to be investigated, as with the D.Tel. scoops on MPs’ expenses fiddling. Em, anyone got a copy of Hansard handy? I dare say that there will be a few super sleuths currently tearing apart every single speech he has ever made in the house, scrutinising his promotion of activities undertaken by those emissaries of the Green Blob whom, no doubt, completely coincidentally, have been simultaneously dropping rather large bungs into the Gummer family trough. I note that the majority of the climate alarmist MSM have been suspiciously quiet about this affair. Funny that. There can’t be anything wrong with Lord Deben getting payments from corps that are heavily dependent on UK climate policy. Otherwise the BBC would have reported it. Teflon Tim Yeo got away with it for years, always cleared by the standards committee, but chucked out by his local group …& got to keep the loot. Recently Gummer was convicted by the BBC of misleading the public (WHAT! The BBC? I don’t believe it) about Tory windmill policy. He was ‘cleared’ of saying that wind produced the cheapest electricity although that is clearly untrue. Now, either he was lying or he doesn’t know his job. On the whole, I think I prefer that he was lying. Excellent news, but presumably they only have the authority to question Mr Gummer. We do need a wider investigation into all members of the climate change committee. All members of the Department of the Environment, past and present, and all the companies that have benefited from government contracts placed on the recommendation of these committees.. Only then will we start to understand the degree of malfeasance if any, is operating within government. The BBC understands that Westminster is a huge purchaser of whitewash. Caught with his fingers in the cookie-jar, huh? Outcome may be related to the size of the vocal outrage. Rosalyn Schofield, CCC Adaptation sub-committee, is a solicitor and a Director of Company Secretariat at Associated British Foods plc. This in Excel format and each member has a separate tab. Chairman – Consultants in corporate respsonsibility (sic) and environmental, social, ethical and planning issues. It makes no mention of the fact that, via Sancroft, he is a consultant to a company which employs another member of the committee of which he is chairman. Personally, I think Deben is going nowhere, he is too heavily ensconced within the system and Claire Perry will not rock the boat.